The praying mantis or simply mantis is a carnivore. It’s a meat-eating insect that has got many small animals on its menu. Just like its bizarre appearance, mantises are surprisingly ferocious predators one that can take on even small birds including hummingbirds. Adult praying mantis is strong enough to kill small reptiles. They have quick launching strategy. Do you have any idea what do praying mantis eat and drink in the wild as well as in captivity? If not, then maybe you’d like to dig deeper. What Do Praying Mantis Eat? – Praying Mantis Diet – How Do Praying Mantis Eat? 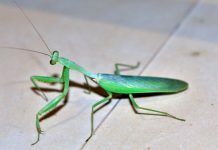 Praying mantis predominantly feed on crickets, grasshoppers, spiders, (monarch) butterflies, beetles, and occasionally other praying mantises. They are tough predators and are known to consume hummingbirds. 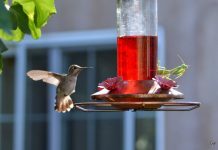 Hummingbirds mostly fall trap to mantis when they come to the sugar water to drink. Most, if not all, mantises are ambush predators. They will prefer to catch live prey and get as close to the prey as possible. When the prey is within its reach praying mantis strikes quickly. They can even camouflage themselves but if they can’t mantises will stalk slowly partially like a leopard. 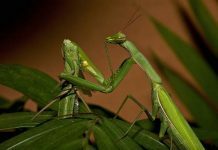 Read More: Do Female Praying Mantis Eat their Mates? A big adult praying mantis is most likely to eat smaller individuals. It will supplement its diet with some frogs, leafhoppers, caterpillars, mosquitoes, small birds, and lizards. The way they wait for the prey resembles a praying posture and that’s how they probably earn their name. Mantises are biotrophic in that they consume carnivorous arthropods and herbivorous arthropods equally. Mantids love to prey on those arthropods that are useful for plants. These animals include butterflies, spiders, wasps, and bees. After finishing a meal, praying mantis is thought to clean its entire body using its leg to get rid of any possible stray bits of insects. Mantises will also clean their mouths with their leg. 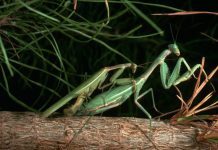 How Do Praying Mantis Hunt? While generally they are sit-and-wait predators but if the prey is within the striking distance then mantises snap out their arm in no time. Praying mantis rarely misses a prey particularly if the prey is about the right size bug. Mantises have got claws attached to the very end of their arms. These claws prevent the prey to escape from the strong grip of mantises. The raptorial forelegs of mantis make it impossible for the prey to even move. However, a few mantis species chase their prey in a way mammals do. For instance Ligariella and Entella likely run after the prey—resembling tiger beetles. The mantis directly affects its overall lifespan. Chinese mantises live much longer when they feed on pollen as compared to when they don’t. 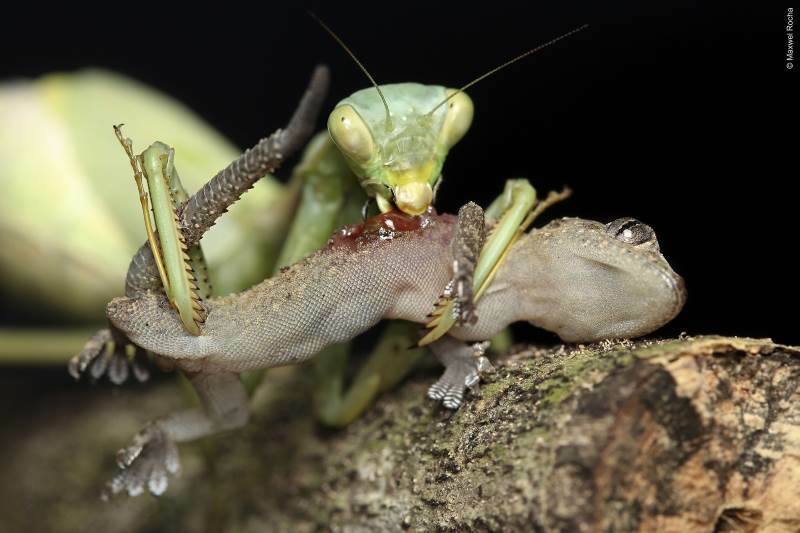 A mantis eats gecko alive. 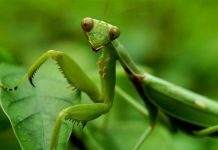 What Do Praying Mantis Eat in Captivity? Praying mantises do well in captivity but in order to get the best results only one individual is recommended to be raised at one time. Mantis doesn’t need a large space. 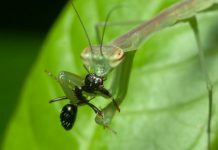 During captivity, the mantis’ diet is primarily determined by its size; the greater is the mantis the larger should be the prey. Feeding young mantis with crickets and flying insects might be a good idea. Adult praying mantis will eat just about anything. You can feed them honeybees, wax moths, fruit flies, flying insects, and house flies. 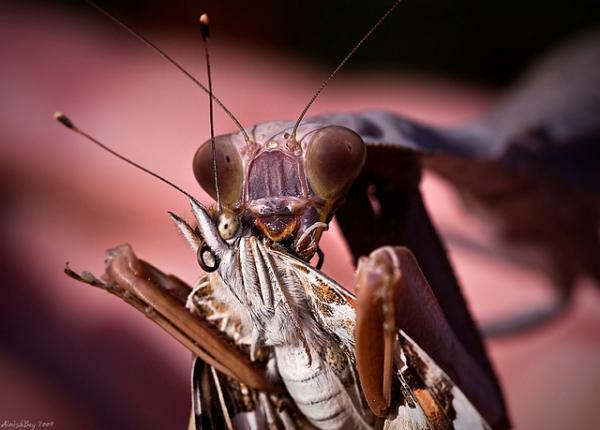 But if your mantis is too hungry then you probably need to feed it grasshoppers, beetle, and crickets but these animals are least preferred prey for a captive mantis. The captive individuals do not drink too often. One or two sprays of water will probably be enough for them. For those species that actually live in the rainforest, you might want to spray some more because they are used to evening showers. Unlike most other stick insects, praying mantises do not typically eat plants. Stick insects typically prefer to bramble, white oak, ficus, raspberry, rose, and leather leaf viburnum. It isn’t clear however if mantises eat these plants. Hurd, L. E., and Eisenberg, R. M. (1990). Arthropod community responses to manipulation of a bitrophic predator guild. 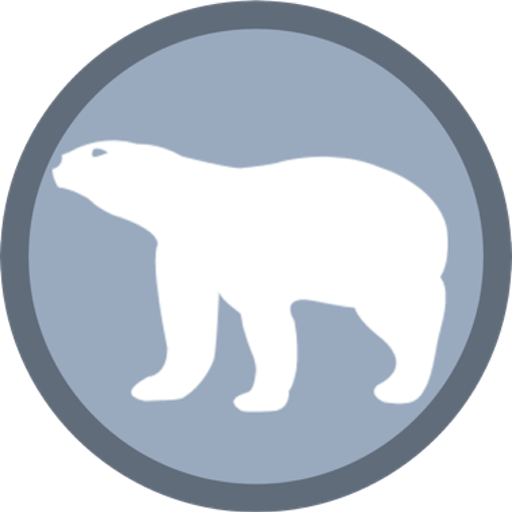 Ecology 76, 2107–2114. Helfer, J. (1963). “How to Know the Grasshoppers, Cockroaches and Their Allies.” Brown, Dubuque, IA.